If there's one thing Australia has brought to the world it's the macadamia nut. 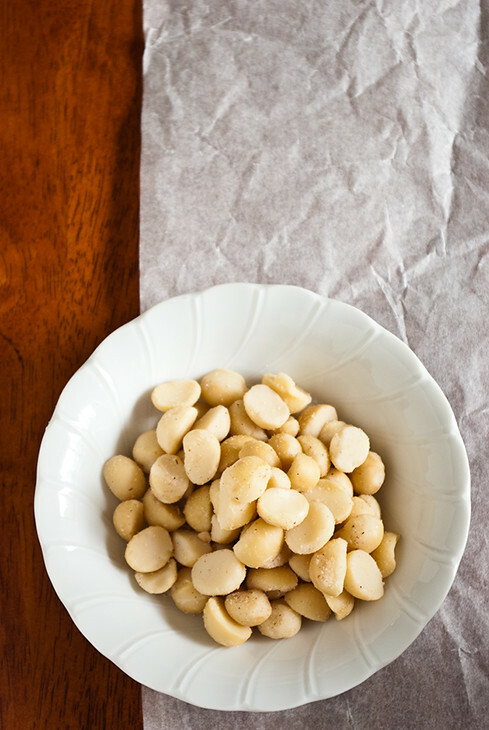 The macadamia nut is without a doubt my favourite nut; it's buttery and tasty without being overwhelming. It also goes amazingly well with white chocolate. Actually, it goes amazingly well with pretty much anything. As a child we had a macadamia tree on our property in upper northern New South Wales. The macadamia tree is one of the two things I miss about living up there; the other is the mulberry tree. As I child we would climb the macadmia tree and pick of the nuts. I distinctly remember a large portion of the nuts being rotten when we cracked them open but when we did find good ones it was completely worth it! Unfortunately neither macadamias nor mulberries grow where I now live. Luckily macamdias can easily be purchased and I do so regularly. Mulberries are less easy to find and, when I do find them, too damaged looking to buy. Preheat oven to 180°C (350°F), grease and line two large cookie trays. Place the butter, vanilla, and sugar in a bowl and beat until light and creamy. Add the egg and beat to combine. Add the flours, nuts, and chocolate and beat to combine. If the mixture is too sandy and does not form a dough, gradually add the water until the mixture is the right consistency to roll. Roll 1 or 2 tablespoon sized balls, place balls on baking trays about 5cm (2") apart; flatten with the palm of your hand. Bake biscuits for 12-15 minutes or until lightly golden. The biscuits will be soft when removed from the oven, cool on trays. These look so lovely! I adore white chocolate and macadamia nuts together. thank you, they were very nice and I highly recommend them! 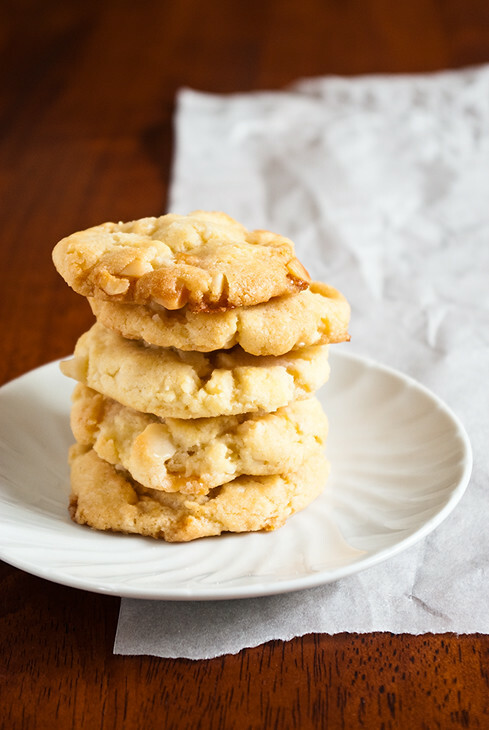 White chocolate and macadamias belong together!